In 1585, 20-year-old William Shakespeare’s petty scheme for revenge against a certain nobleman’s steward backfires because it wasn’t as well thought-out as he supposed. Leaving his wife and three children in his parents’ care, he falls in with a traveling acting company recently come to Stratford and for whom he wrote a few lines for one of their plays. Meanwhile, in Italy, the Pope has died and Cardinal Montalto plots to become his successor while Venice gathers to select a new Doge. Sir Henry Carr is being sent as ambassador to the Court of Venice to make an accord pitting that principality and England against Spain while that country is in war with Holland. He needs an acting troupe as part of his cover and Will’s company fits the bill. Unfortunately, once on the Continent, the entourage is attacked, and everyone but Will and actor Nicholas Oldcastle are killed. Entrusted with the papers Sir Henry was to take to the new Doge of Venice, Williams convinces Oldcastle to masquerade as Sir Henry while he’ll be the nobleman’s steward, Fallow. They meet an Italian nobleman also going to Venice, and ride along with him, unaware he’s the deadly Prospero, the new Pope’s hired assassin, and, as they say, the plot thickens. There always has to be a pretty woman in the mix, and she’s one in whom handsome, flirtatious William meets his match. But is she friend or foe? Williams has no idea; all he knows is that he’s smitten by her beauty as well as her mind. He soon realizes, however, that the lady has another agenda. The lady’s answer may, or may not, solve the young playwright’s problems. There’s little to no information on William Shakespeare in the years 1585–1592. 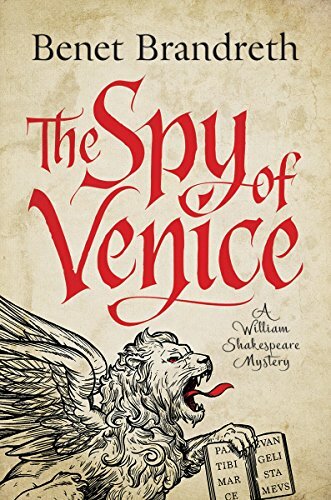 The Spy of Venice is a fictionalization of what might’ve happened during those “Lost Years.” This novel can only be described as an adventuresome romp, intriguing, entertaining, and a story of which the Bard himself might approve. “I’d rather be in my bed in the company of a cup of sack than here among the princes of Europe,” muttered Oldcastle. paraphrasing Lady Macbeth’s orders to her husband in Macbeth. Many of Shakespeare’s plot devices abound in people masquerading as others and in mistaken identities. Events will also evoke scenes from various tragedies, as the drowning of the assassin Borachio in a barrel of wine foretells the fate of the Duke of Clarence in Richard III. Characters themselves are also obviously the models for more famous ones. Oldcastle is surely Falstaff and Prospero undoubtedly mirrors his namesake. This is a novel that will appeal to the mystery lover and those of historical adventures as well as Shakespearean scholars. Author Benet Brandreth is the rhetoric coach for the Royal Shakespeare Company. In The Spy of Venice, his expertise is evident in all three categories. The sequel, The Assassin of Verona, is eagerly awaited.